Bahria University Medical and Dental College (BUMDC), Karachi Admissions 2017. 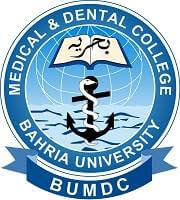 Bahria University Medical and Dental College was established in 2008 as Private Sector Medical College under Pakistan Navy. It is the constituent College of Bahria University. BUMDC is recognized by Pakistan Medical and Dental Council (PMDC) and it is also included in International Medical Education Directory (FAIMER). In 2015, it was placed in 'A' Category Medical and Dental Colleges by PMDC. Minimum 60% marks in Intermediate (Pre-Medical). Candidates must appear in BUMDC NTS Entry Test. Foreign Candidates can also apply on the basis of SAT-II (Min 550 marks in each subject). Note: Candidates awaiting result are also eligible to apply, but they have to submit a hope certificate from their Institute. However, they will have to submit the result of Part-II before the Entry Test. Entry Test will be according to the syllabus of Intermediate (FSc / A levels). There is no Negative Marking in the Test. Third Position holder in MBBS will get 50,000 Scholarship. Create a new account by filling your details. After that login to your account and fill the required details carefully. Candidates applying for DPT should select Spring 2018 option.